Ah, it has been so nice to spend some time with family over the Thanksgiving holiday, reliving memories, both of heartache and joy, laughing till your sides hurt and watching the next generation turning into little people. So very much to be thankful for. 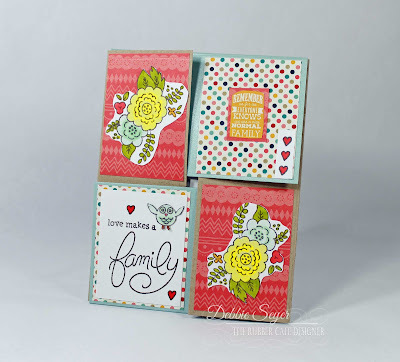 I have one more card with the Love Makes You Family Creative Cafe Kit; Family Tree. I stamped the images out on white cardstock and then colored them with Copic markers before fussy cutting them. 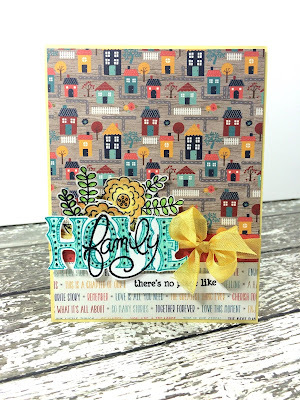 I created the card by layering a piece of the paper from the Love Makes You Family Creative Cafe Kit; Echo Park The Story of Our Family collection measuring 4 x 5 1/4 inches onto a piece of the Blue Shimmer Cardstock from the kit measuring 4 1/4 x 5 1/2 inches. 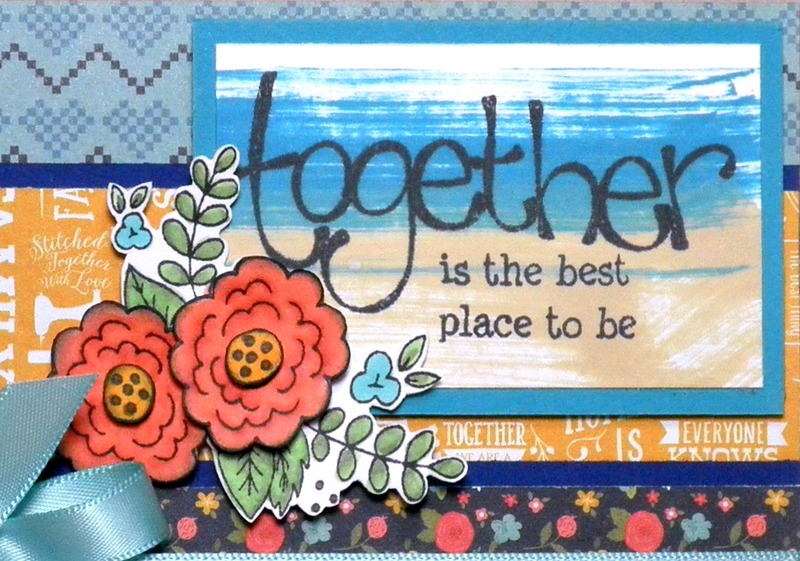 I attached the cut out images to the card base with Scrap Happy Glue and then cut out elements from the paper kit, creating banners as shown. The banners are all attached to the card with foam tape for a bit of dimension. I punched a hole in the word banner with a Crop-o-Dile and then tied a ribbon from the kit in a bow before attaching the panel to an A2 folded piece of cardstock. 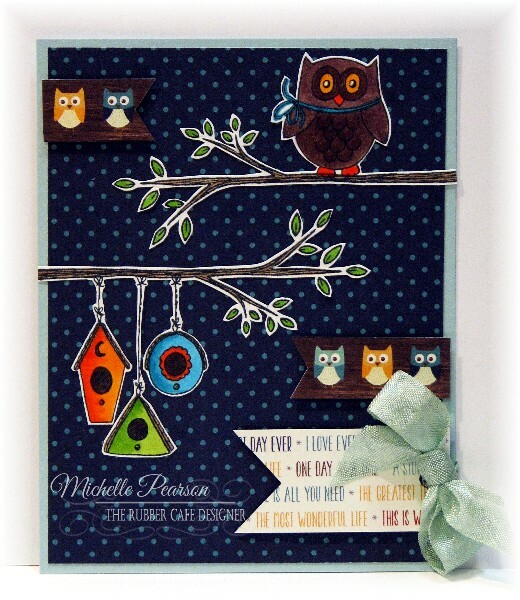 For the first card, I used the Exclusive Creatively Clear Family Tree stamp set and stamped the owl family onto white cardstock with Memento Tuxedo Black ink. The owls were colored with brown shades of Prismacolor pencils and then carefully trimmed out from the white paper. A 3.75" circle was die-cut from the yellow cardstock. Next, I spritzed a piece of acetate with Fireworks Tangelo and Summer Sky misting spray and then pressed it onto the yellow circle. The branch was then stamped and colored in with Le Plume markers. 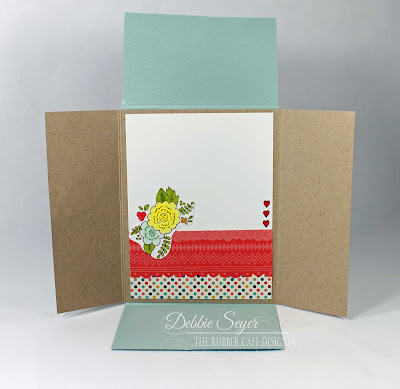 A larger circle mat was cut from the solid 6X6 paper and layered onto the card with foam adhesive. 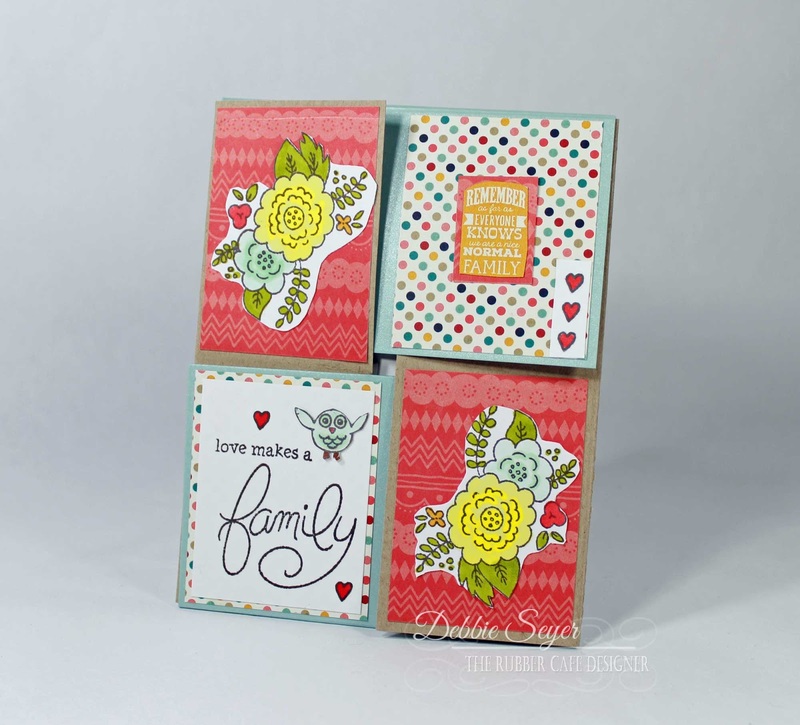 For the next card, I added some shading to the "family" stamp from the Exclusive Clear Home Sweet Home stamp set. After stamping the sentiment onto the olive green cardstock with Memento Tuxedo Black ink, I used a Zig 03 black pen to add the fill lines. Draw the lines on the downstroke of each letter. To do so, I just mimicked the motion of writing the word "family" and each time the pen goes down with the shape of the letter, add a shade line as shown above. Now, fill in the area with the same black pen; you may also wish to use hash-lines instead of filling in with a solid color. 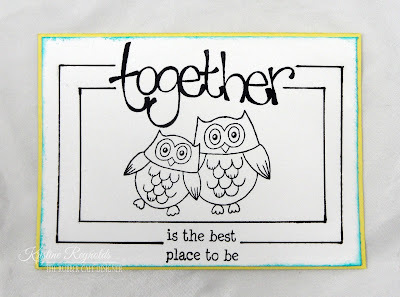 The word "together" was stamped just below the word "family" and so that the tail of the "Y" intersected with the letter "T". The sentiment at the top was curved slightly before stamping. I used a walnut ink to distress the edge of the circle after it was die-cut. Two 1/8" holes were punched at the sides of the circle and twine knotted through to tie in with the sentiment! 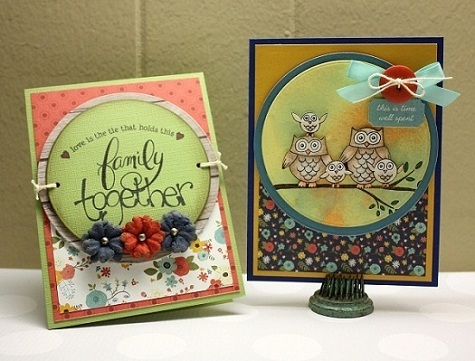 Both cards were made into A2 size and if you will notice, I used the same easy design for both cards! Hi everyone! Laura here today sharing another card with the November Creative Cafe' KOTM: Love Makes You Family. 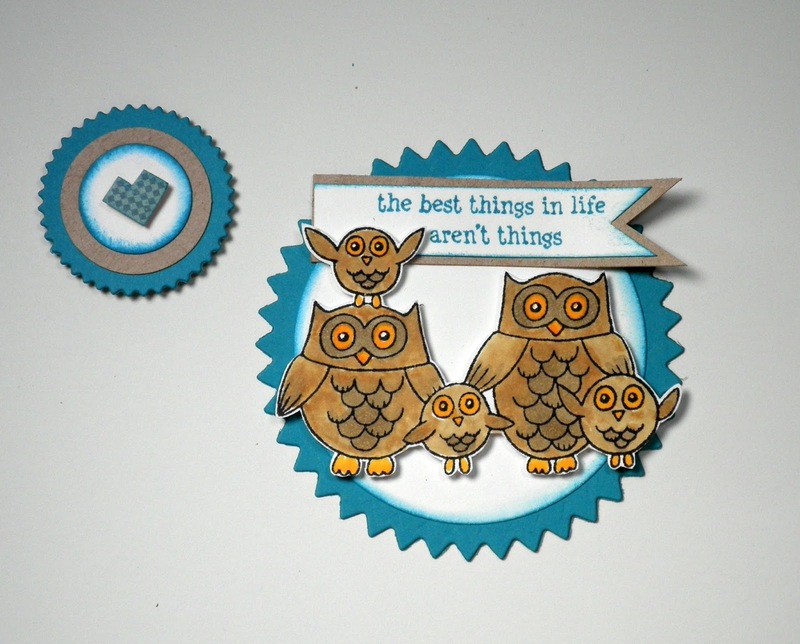 Base: 5&1/2" by 4&1/4" aqua cardstock. First Layer: Cut a 5&1/4" by 4" piece of kraft cardstock. Turn on its side and slice at 1/4" intervals LEAVE A 1/2" BORDER around the edge, so you don't slice it all the way thru. You can do this using a craft knife or trimmer (I find it easier to measure with a trimmer). I worked from left to right, and the right (which will be the top of the card) will be a little shy of 1/2" inch (it's about 3/8"). 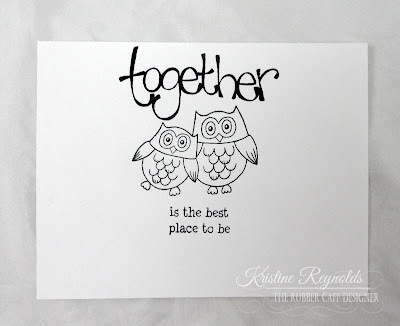 To make the center panel, stamp the owl family on white cardstock in Black Tuxedo Memento ink, and color with markers, then fussy cut out. Stamp the sentiment on white cardstock using the Peacock Feather ink, trim to a banner shape, brush edges with Peacock Feather ink, and mat on kraft cardstock. Die cut a center shape, I used pinked edge dies, and circle dies and punches to create the two circles. Small circle--3/4" punch/white cardstock, brush with ink, mat on 1" circle punched from kraft, and mat on 1&1/4" pinked edge circle die cut from aqua cardstock. Fussy cut heart from stitched heart patterned paper and foam tape to center of circle. Large circle--die cut 2&3/8" circle brush with ink, mat on 2&3/4" pinked circle cut from aqua cardstock. 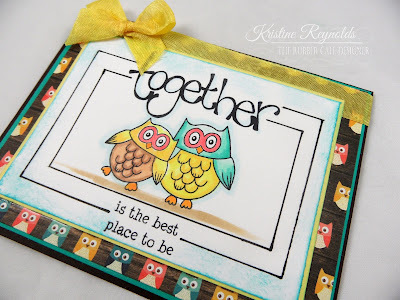 Add pieces to the center of the card front, using foam tape. Tie a ribbon to the side of the card. Thanks for stoppin' by today! 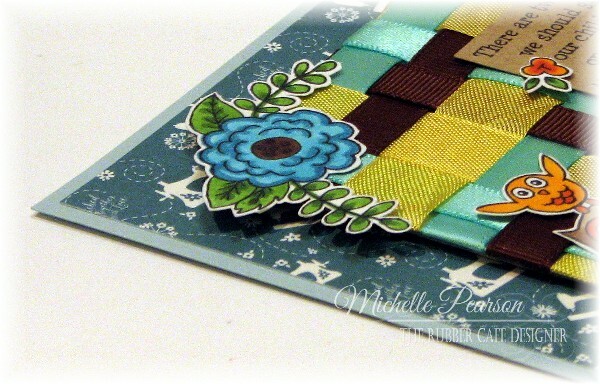 Ribbon weaving and stamping are a great combo.....give it a try! Roots and wings...that seems to be on my mind these days...seems like yesterday the kids were babies...and now I have one finishing up middle school! I know these last four years or so are going to FLY by! We are busy making memories!! 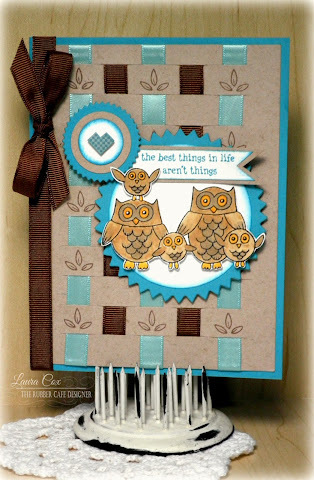 Today's Rubber Cafe Love Makes You Family Creative Cafe Kit was again my focus with it's adorable owl images and that famous quote. 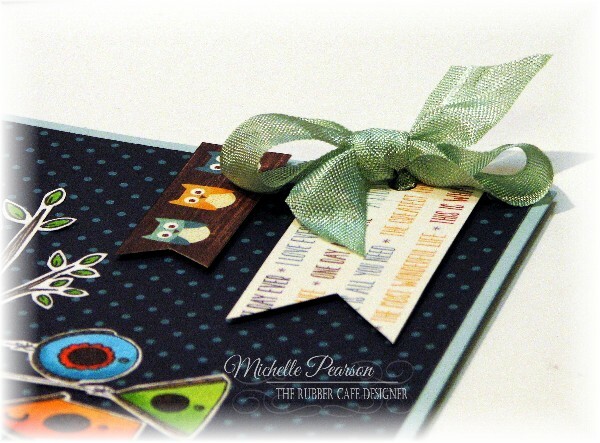 The blue shimmer card base is 4 1/4 x 5 1/2 inches, and the patterned paper is 4 x 5 1/4 inches. I created a ribbon-woven background by cutting a piece of cardstock 3 x 4 1/2 inches. Then I simply taped a piece of the ribbon in the kit along one edge and continued to alternate them across horizontally. 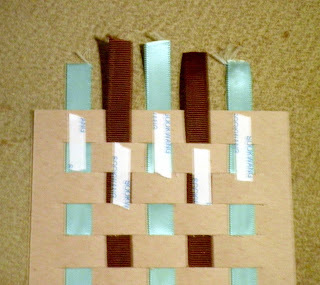 Next I put the ribbons in the same color order and repeated the process along a vertical edge. 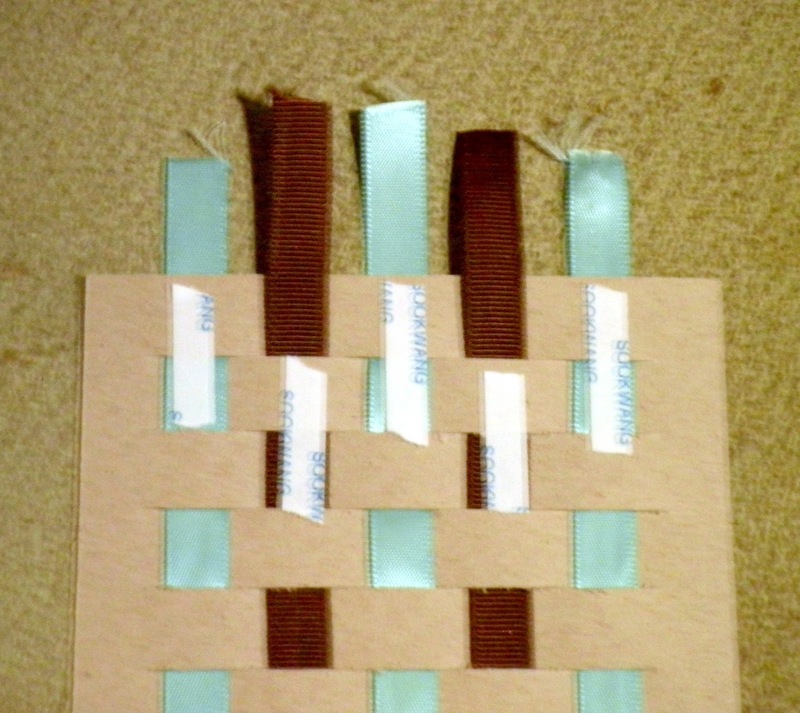 Then I wove the pieces over and under in a basket weave manner until I reached the opposite edge of the cardstock and secured the tails on the back. This panel is popped up with foam tape. I stamped and colored the images with Copic markers. 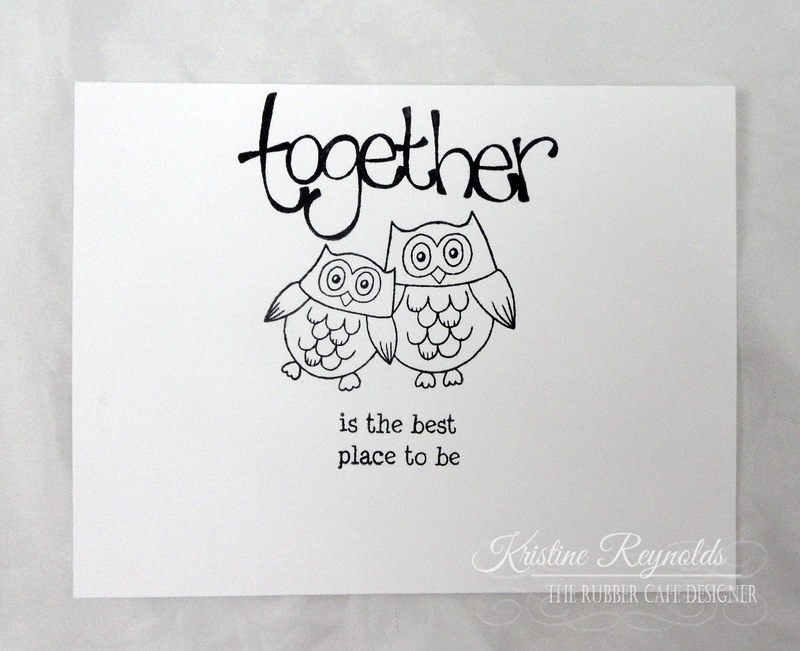 The flowers and owls are stamped on white cardstock and are fussy cut. The verse is stamped on kraft cardstock measuring 1 1/2 x 1 inch. 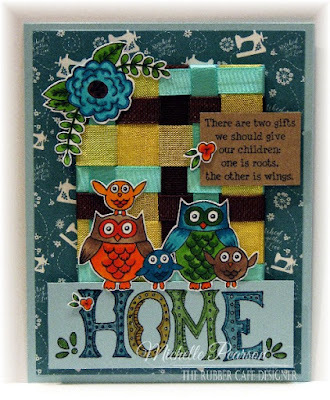 The home is stamped on a piece of the blue glimmer cardstock measuring 3 5/8 x 1 3/8 inches. 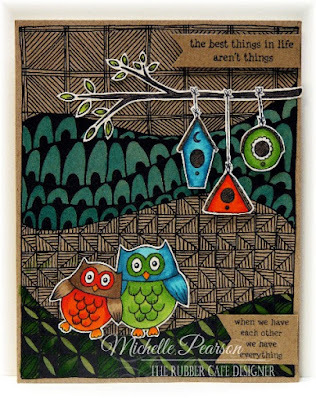 I stamped this image with Stazon ink and then carefully colored it with Copic markers, taking care not to touch the stamped image and cause smearing. 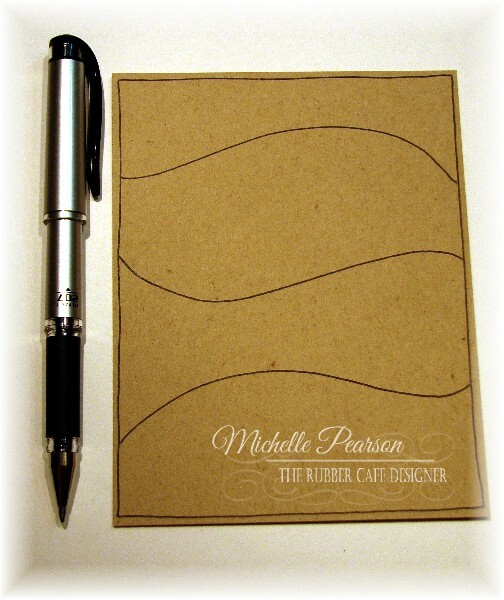 Paper: The Rubber Cafe'-Creative Cafe' Kit- Echo Park's 6x6 pad- The Story of Family and Bazzill Cardstock. Good Morning TRC friends. Mary-Ann here with another fun card created with the November Creative Cafe KOTM - Love Makes You Family. *4 1/4 x 11 yellow Bazzill cardstock base folded in half. *3 1/2 x 4 block of the Echo Park paper with houses added to the top of the card. *1/2 x 4 block of the coral paper. *1 1/4 x 4 block of the word paper. *Wrap yellow ribbon around the coral paper and tie into a bow. This is your card base. 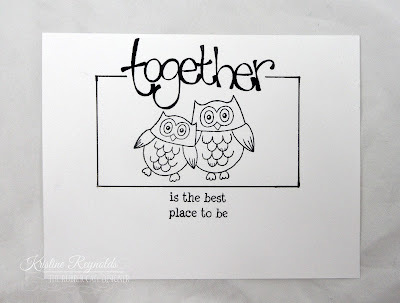 *On white paper, stamp and heat emboss the word 'HOME' with the blue ink provided in your kit and clear embossing powder. *Fussy cut this out as shown in the photo. Stamp the large flower twice with Black Memento Ink. You can see here that I layered all of these piece with foam tape for dimension. You do not have to. If you are mailing this card, just layer the papers flat on the card. Turn them up with your fingers for dimension instead. This is a pretty fun month here at TRC. Check back daily for more Design Team Inspiration. Paper: The Rubber Cafe'-Creative Cafe' Kit- Echo Park's 6x6 pad- The Story of Family and Yellow Bazzill Cardstock. Hello TRC Fans! 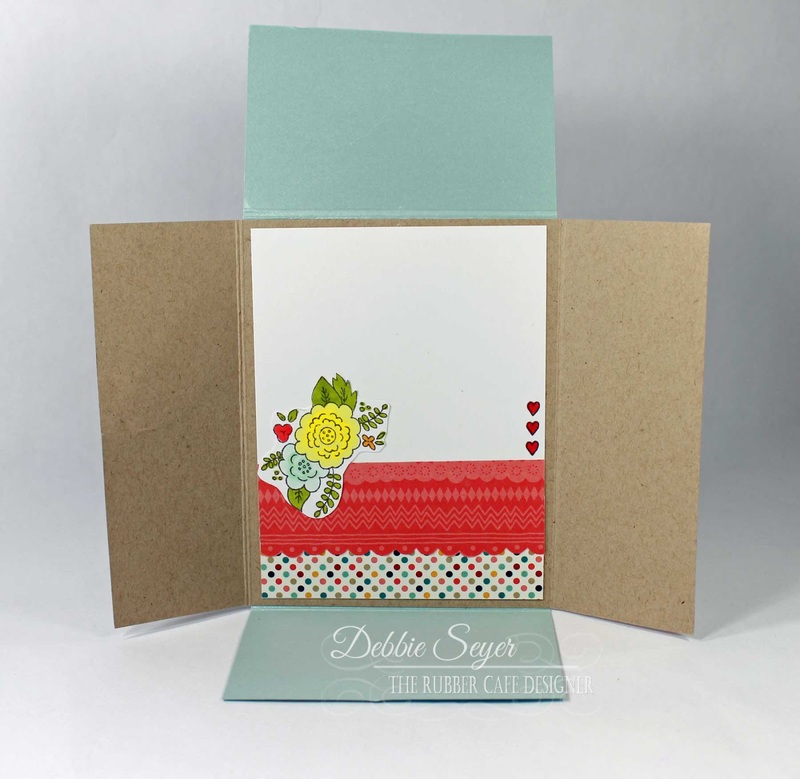 Debbie here and I have a 'new-to-me' fancy fold card that I want to share with you today. Using this month's kit, Love Makes you family and all its goodies. With it, I created a Quarter Fold card. Let's take a look at a photograph of my card. Here is what it looks like inside the card! I also have a video that I created, showing you how to make this card. It's really easy....Here are the paper dimensions that you will need for this card. 1 piece cardstock trimmed to 4 1/4 x 11"
1 piece cardstock trimmed to 5 1/2 x 8 1/2"
2 pieces of patterned paper trimmed to 2 x 2 1/2"
2 pieces of patterned paper trimmed to 1 7/8 x 2 5/8"
You will also need a Scor-pal or other scoring tool, liquid adhesive and the contents of your kit! Here is a video showing you how to put this together! I hope you give this Quarter Fold Card a try! Thanks for stopping by today! I started with standard, manila shipping tags from my stash. 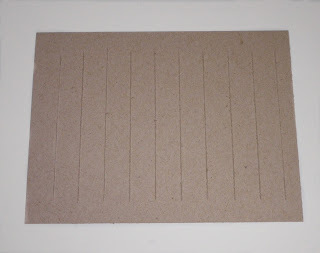 You could create your own by cutting a triangle, trimming off the corners and punching a hole out of any of the papers or cardstock you have received in your kit. I inked around the edges with the Mini Ranger Distress Ink – Antique Linen. 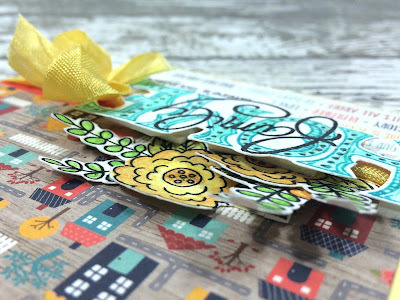 For the first tag, I stamped the flower bunch motif from the "Home Sweet Home" Stamp Set onto the top and bottom of the tag with Memento Tuxedo Black ink. Next, I colored in the leaves and smaller flowers with Faber Castell Pitt Pencils. I stamped the larger flower twice onto the red dot paper found in the 6X6 Paper Pad and trimmed out. It was attached over the original stamping with foam adhesive. 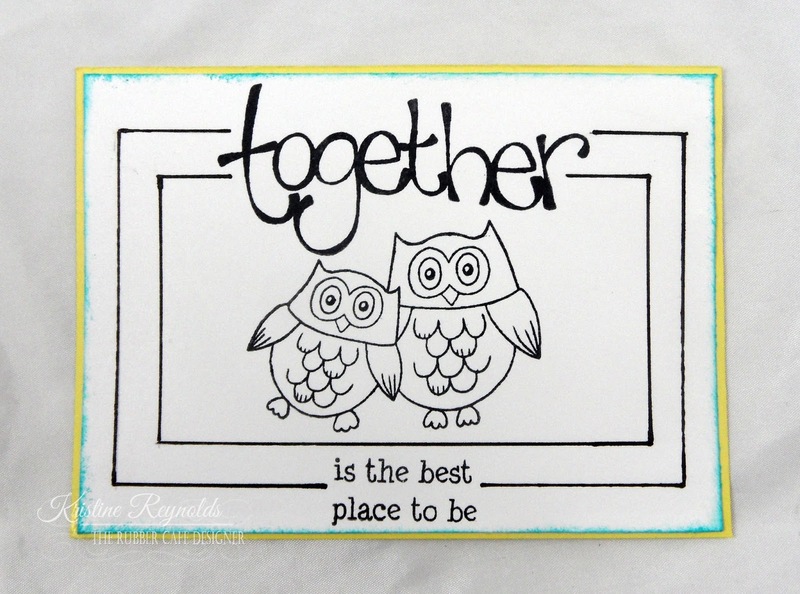 I stamped the sentiment onto the blue grid paper and die-cut it with an oval shape. For the sub-sentiment, I curved the stamped slightly so that it would follow the shape of the "Y" in family. The second tag includes stamps from the "Family Tree" Set. Before stamping, the background of the tag with lightly sponged with the Mini Ranger Distress Ink – Peacock Feathers. 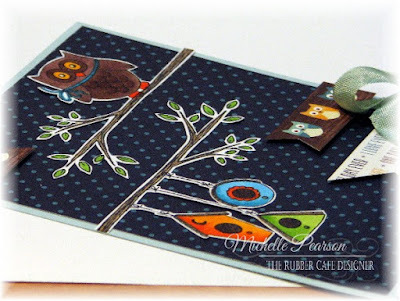 The owl was stamped onto the kraft cardstock and trimmed out. 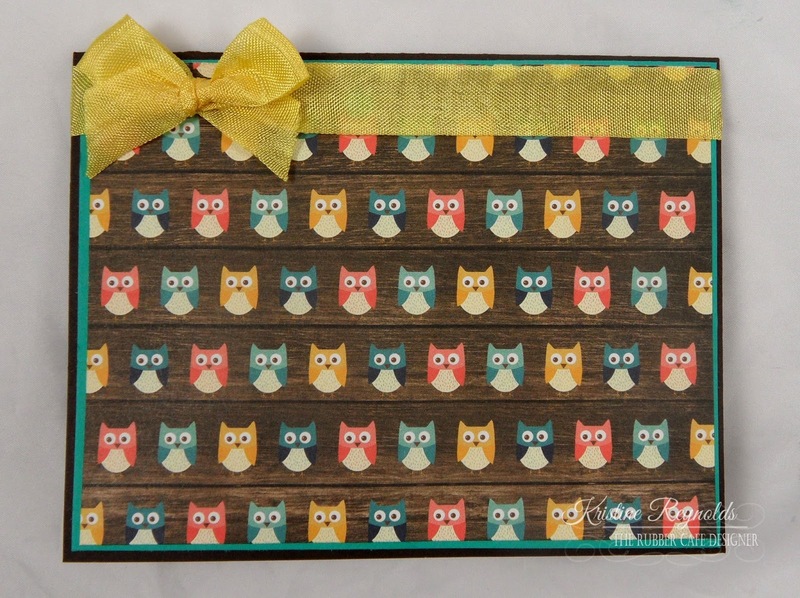 The eyes were stamped in two part onto white cardstock and the teal blue paper from the 6X6 pad. Again, I used Faber Castell Pitt Pencils to color in the branch and leaves. I love tags! 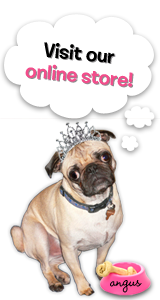 They can be added directly to a card, package, basket or scrapbook pages! Kristine here today with another card that I made with the November Kit of the Month Club from, The Rubber Cafe'. 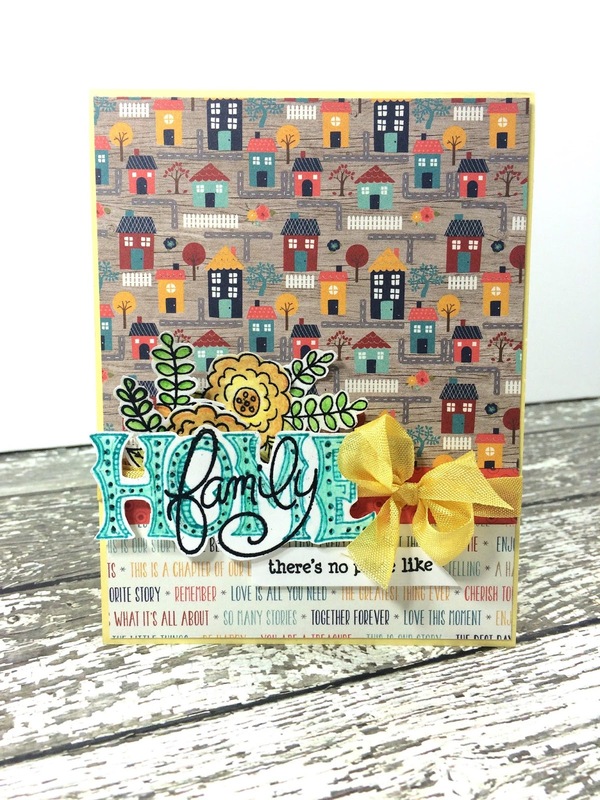 This month's kit called Love Makes You a Family! The kit includes Echo Park's 6x6 pad- The Story of Our Family by Designer Lori Whitlock, and tons of amazing ribbons and mini Distress Inks! 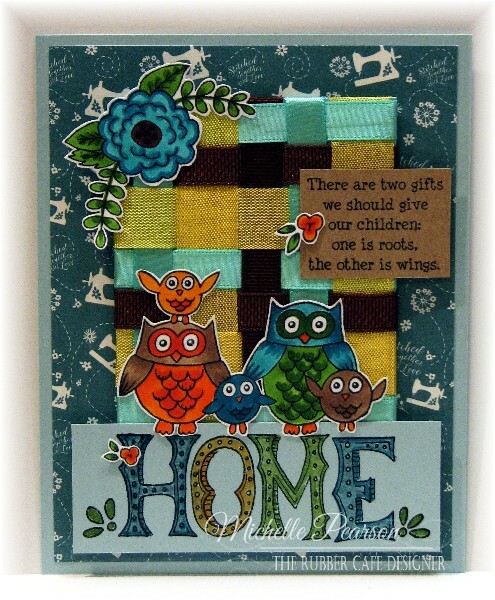 For today I used the stamps from the Creative Cafe' Kit, Family Tree stamp set, and the add on set Home Sweet Home. It's a simple card that showcases a great way to use the pen that comes with this months kit. 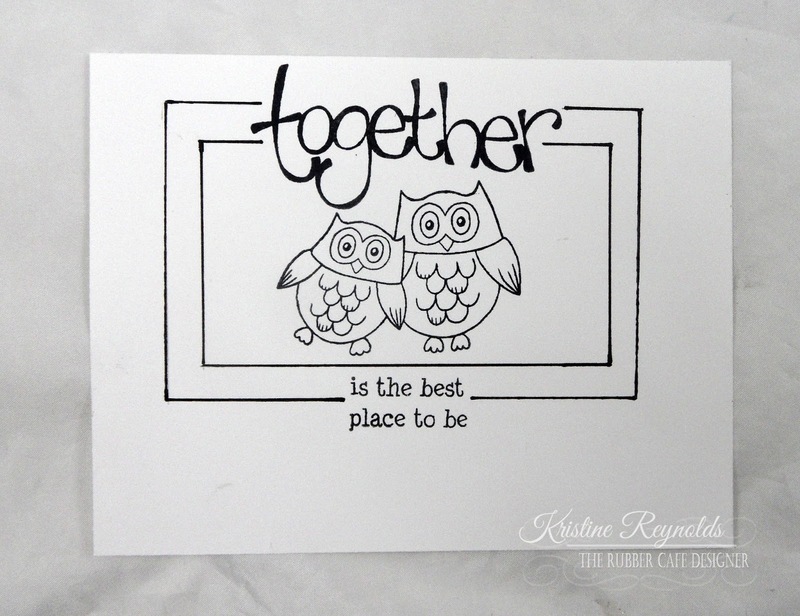 To create this card I started by stamping the sentiments and image below with Memento Tuxedo Black ink on a white panel. I used the black pen that came with this months kit and a ruler to draw the box around the image. The I drew one more box aproximately 1/4" wider than the original box. I trimmed around the edges to create a 4 1/2" x 3 1/4" panel. I sponged the Peacock Feathers Distress ink around the edges and then backed it with a 4 3/4" X 3 1/2" panel of yellow cardstock. I created the card base out of dark brown cardstock. 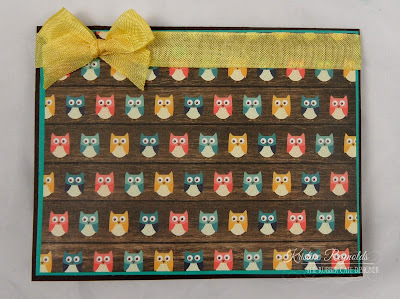 I added a panel of teal cardstock (5 3/8" x 4 1/8") with Scrap Happy Glue. 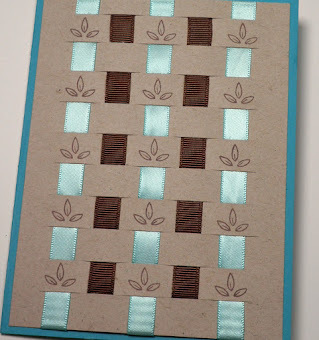 The I adhered a panel of patterned paper 5 1/4" x 4", to the card with Scrap Happy Glue. Then I tied a yellow ribbon strip around the top of the card. Finally, I colored the image panel and then adhere to the front of the card with Scrap Happy Glue. Quick and easy card that looks like you spent hours on it. I hope you enjoyed today's card. Check back every day to see all the amazing projects by the rest of the team! Hi everyone! 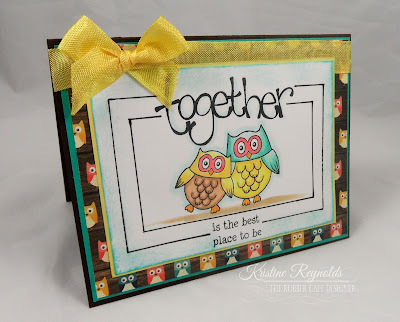 Laura here today, sharing another card with this adorable Creative Cafe' KOTM! Base: 5&1/2" by 4&1/4" kraft cardstock. First Layer: 5&1/4" by 4" piece of stitched heart patterned paper, glue to base using Scrap Happy Glue. Center strip: 4" by 2&1/2" piece of family word patterned paper matted on a 4" by 2&3/4" piece of blue cardstock. Glue to first layer about 1/2" from the bottom edge. 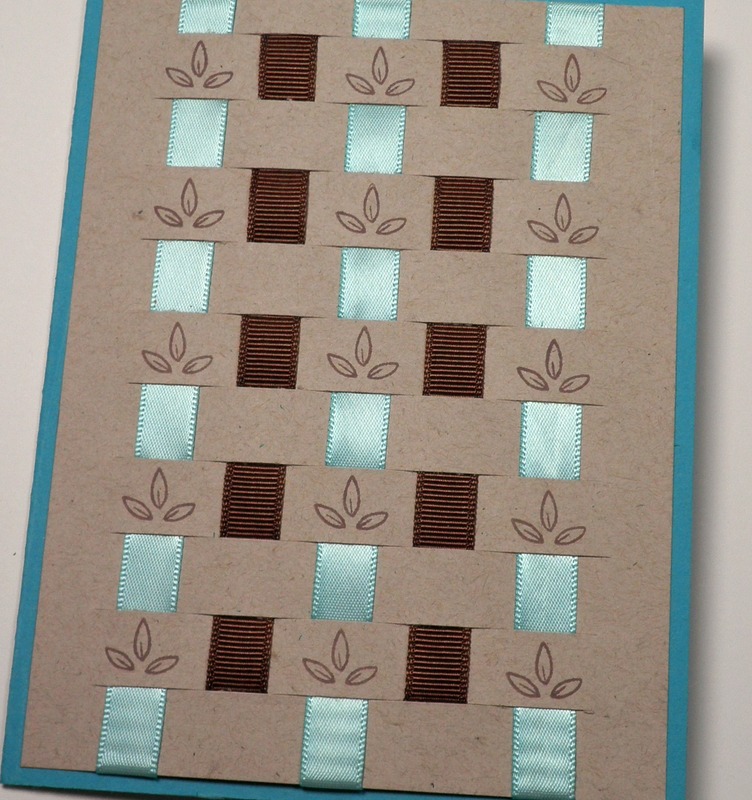 Then cut a 4" by 1" piece of floral patterned paper and mat on a 4" by 1&1/4" piece of blue cardstock. Wrap with aqua ribbon. Add a bow. 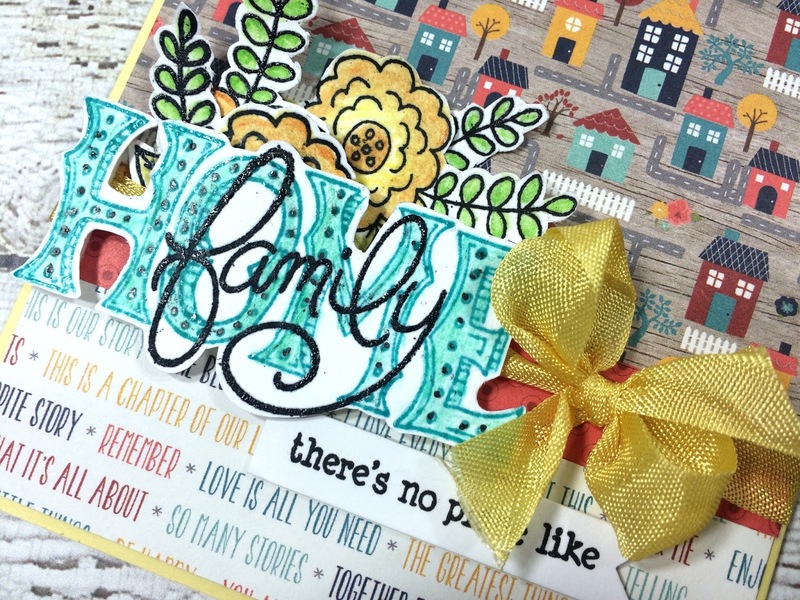 Glue to bottom edge of the family word piece. Stamp the flower 5 times. Color the entire stamp once. Then color just the center flower twice and then color just the center of the flower twice. Fussy cut all pieces out. Layer these flowers and centers using foam tape. Cut a 2&3/4" by 1&3/4" piece of white cardstock. 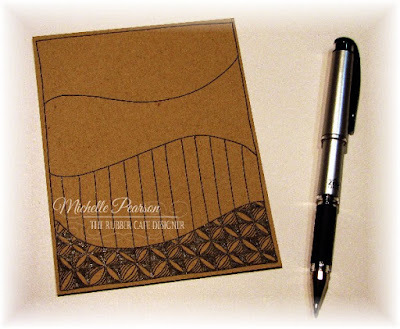 Swipe the two small Distress Ink pads across the cardstock to create two streaks of color. 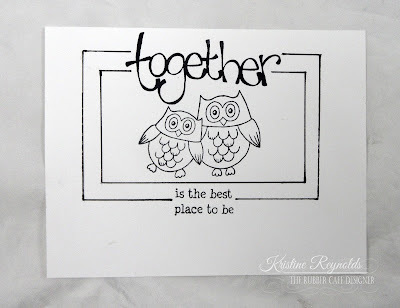 Stamp the sentiments in Black Tuxedo Ink on the Distress Ink, then mat this piece onto a 3" by 2" piece of aqua cardstock using Scrap Happy Glue. 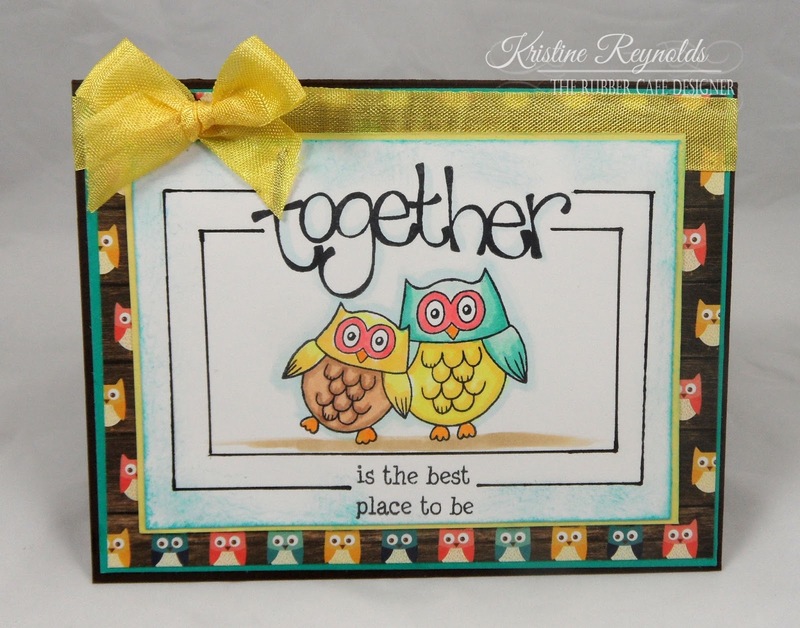 Foam tape the sentiment to the upper right corner of the card. 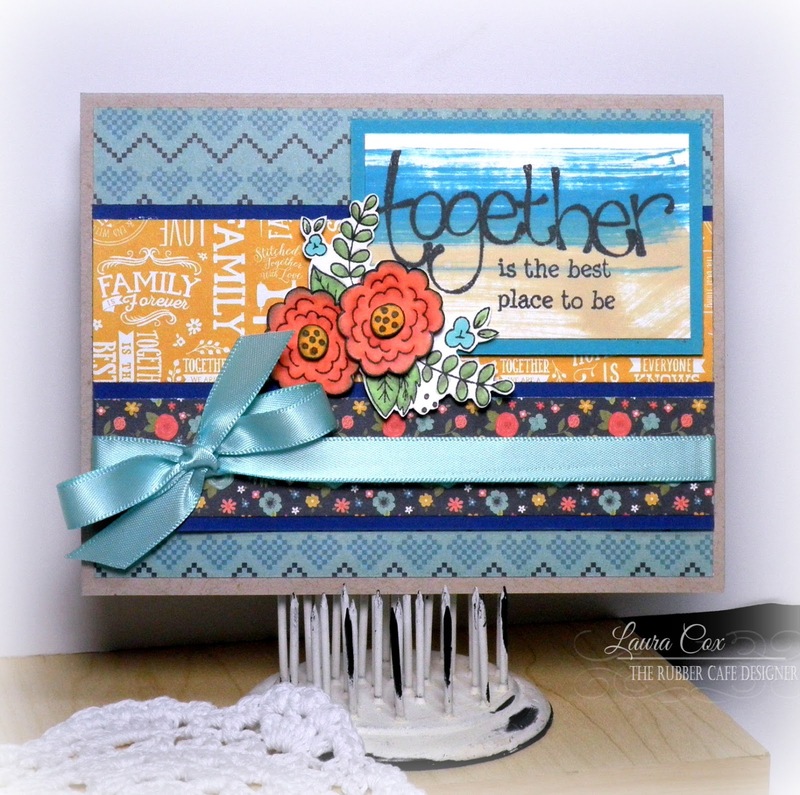 Glue the floral piece to the corner of the sentiment, then foam tape the extra flower next to it. Thanks for stoppin' by today! Stop back soon for more inspiration! Oh, I had fun with this card for The Rubber Cafe! Included in this month's Love Makes You Family Creative Cafe Kit was a Signo Uni-ball Impact 207 pen. 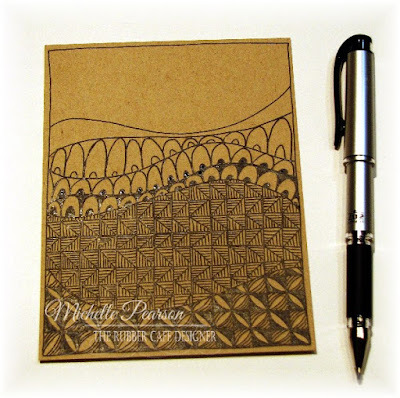 If you follow my blog, you would know that I have fallen for the Zentangle-Inspired Art movement. There is something so relaxing and satisfying about creating patterns....with simple lines that can frame or showcase any image. 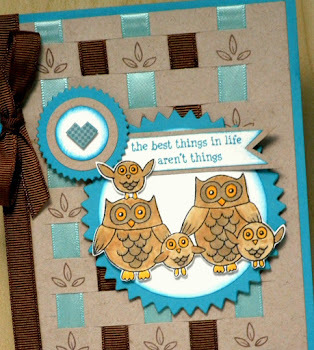 To make this card I took a piece of the kraft cardstock and cut it to 4 1/4 x 5 1/2 inches. I free-hand drew the frame and then divided it into four similarly sized sections. I used the pattern Strimonds on the bottom of my card. Next I did a pattern called Chard, which you can see I have started in this photo. The patterns are all easy to do, just break them down into steps and work your way through! Next is a variation of the Tucson pattern. Finally, I finished the background with a pattern called Tri-Linz. You can find these patterns and many more online. I have a hint for you when selecting patterns; alternate patterns with dark and light designs. Similarly alternate rounded and linear designs for a pleasing effect. For a bit of contrast I used the Peacock Feathers Distress Ink in the kit and Mowed Lawn Distress inks to paint the background. I smooshed them onto an acrylic surface, spritzed them with water and then painted them onto my background. TIP: For the lighter green areas, I spritzed the ink with water to dilute it further for a lighter value. I stamped the images on white cardstock and colored them with Copic markers and then fussy cut them before popping them up on foam tape. 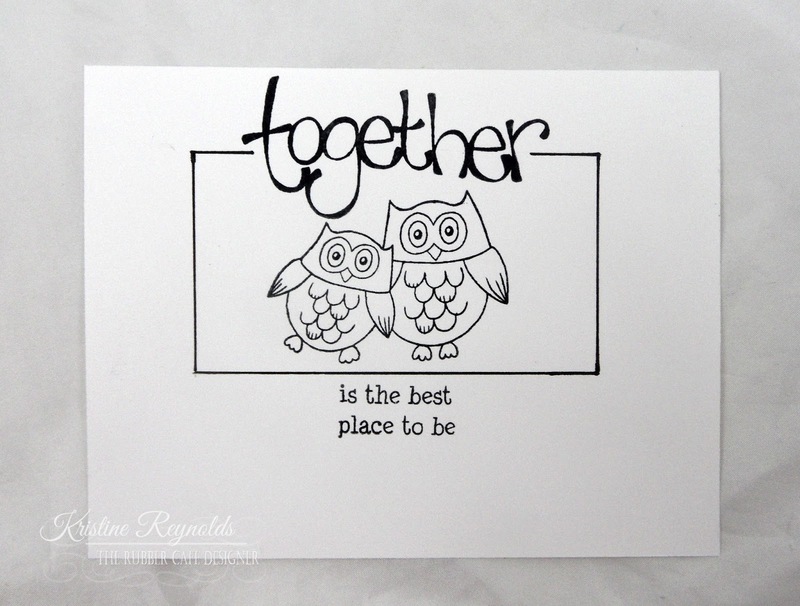 The sentiments are stamped on kraft cardstock, and are trimmed to 2 x 1/2 inch and 1 1/4 x 3/4 inch.